The incredible, Caribbean island of Saba is a land of opposites. From the gorgeous, tropical scenery to the white-knuckle airplane landing, Saba is the place to be. Only five square miles in size, it’s the smallest of the all Dutch Caribbean islands and just 28 miles southwest of the island of St. Maarten. Small in size, but oh it delivers untouched, visually stunning beauty at every turn. It’s a nature lovers’ paradise that must be explored at a leisure pace, to take in all that it has to offer. Island life on Saba is slow paced, but you will receive a warm welcome from the locals. The people understand the importance of tourism to their island and visitors very much appreciate the hospitality during strolls through the surrounding villages. Saba has been called “The Unspoiled Queen.” Tourists will notice the melting pot of people from different nationalities, including those from Europe plus African and Latin descendents. You’ll hear various spoken languages like Dutch, English and Spanish. In addition to wandering Saba’s rocky coastline, for a glimpse into the history and culture of the Caribbean island, be sure to check out their museums. You’ll find the The Harry L. Johnson Museum inside a 19th century sea captain’s cottage. Located in the historic district of Windwardside, the museum is surrounded by varieties of lovely flowers. Inside, you will view collections from both 19th and early 20th century, as well as artifacts discovered on various Amerindian archaeological sites on the island. Another option is the Dutch Museum Saba. View Dutch antique collections that are as old as 150 to over 400 years old! The collections include a wide variety of items including: books, tapertries, tiles, porcelain, paintings, lacework and furniture. Regarding accommodations, you can choose between many options, depending upon your preference, such as hotels, villas, lodges and small cottages. For a VIP experience, stay at the the Queen’s Gardens Resort. Perched about 1,200 feet above sea level, this luxury resort provides stunning views and is upscale, but with a casual chic vibe. Queen’s Gardens Resort offers guests 12 elegant and spacious suites. What is unique is that each suites takes up an entire floor of the building. Enjoy scenic views of the blue waters of the Caribbean Sea or nearby Saba Rain forest. For a romantic experience, relax in your own, private Jacuzzi. 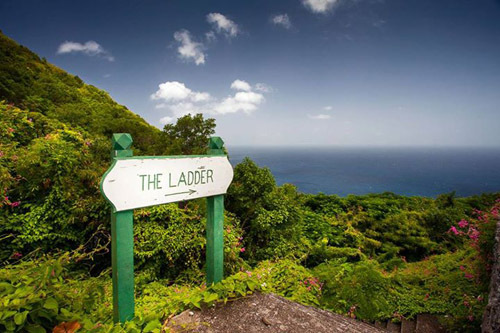 Saba is an island of not just lying on the beach, but countless outdoor activities. You can try hiking one of the many beautiful trails and explore the rainforest, or take to the water and try either snorkeling, scuba diving, yachting or deep sea fishing. Spending a vacation getaway on Saba will leave a lasting impression. Time seems to stand still as you immerse yourself in the Caribbean lifestyle. The island beckons and welcomes all who want to discover it. Offering exquisite, natural beauty …. be sure to add it to your bucket list. A stay is perfect anytime of the year and ideal for a honeymoon, anniversary or just to rekindle your love. If you would like to discover this Caribbean gem, contact us today and we can plan and book your luxury getaway to the island of Saba. Relax in VIP style and enjoy nature at its very best. Learn about other fabulous getaways by reading this luxury blog.